I love one bowl meals, they seem so comforting somehow. This recipe was passed to me years ago by my friend Rosie, who in turn was given it by a Gambian lady, I believe. You can use whatever veg you want, but the combination below was from a recent harvest and worked wonderfully. Toss the vegetables in a large baking dish with 1 tbsp olive oil and roast at gas 6 for 45 mins. Prepare the giant cous cous according to the pack instructions (mine were to toast in olive oil, add water, and then cook until the water was absorbed). Mix together the lime juice, ginger and honey to make the dressing. You can add more honey to make it sweeter, but bear in mind that the combination of veg above is quite sweet naturally anyway). 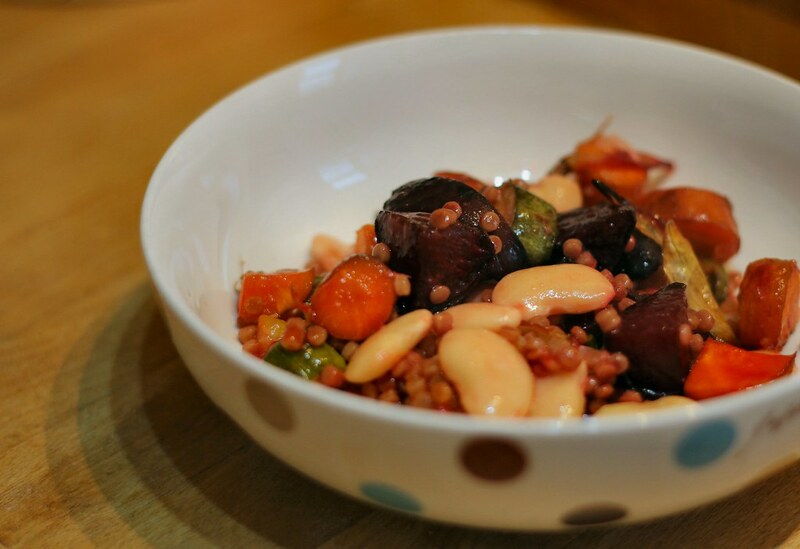 In a serving dish mix together the roast veg (along with any oil from the pan), cooked cous cous, and the dressing. Serve and eat immediately or at room temperature.